The rendered image above was supplied and is displayed to show the context of the proposed installation. The building is alive, a living entity that is breathing, pumping liquids and transforming energy. An organism within a greater ecosystem, interconnected. Within the library is a mass of information and knowledge, synapses of books, media and human interaction. No work needs to be done to further symbolise the brain. 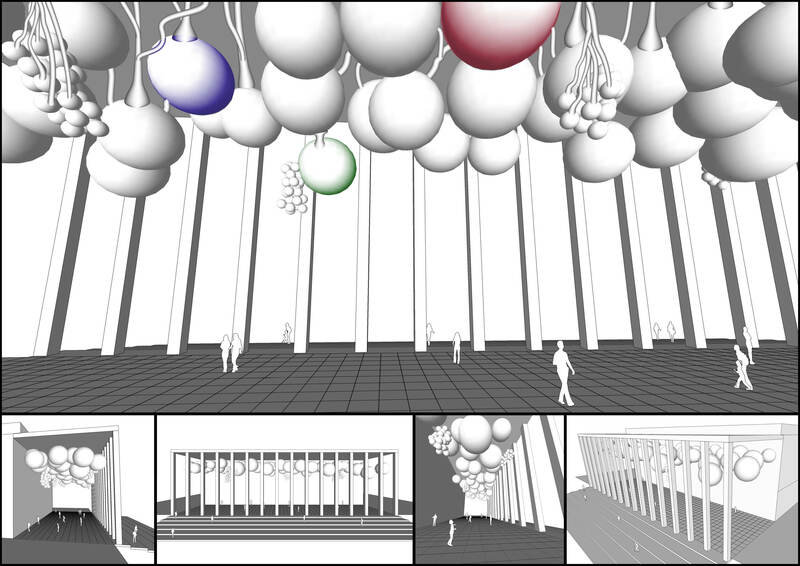 Above the public concourse will hang an ecology of large and small elastic spheres connecting with each other and the building through a network of arteries. The spheres are pulsating, inflating and deflating in measured rhythm to the heart and lungs of the city. Each sphere will represent a data set – red hues of colours the human building systems, green our native animals and bird life. When the power generation increases the power sphere will grow in size, quiver in colour and pump faster. When the water usage increases, the water sphere will grow in size, woosh with sound and pump faster. During the busiest time of the library’s cycle, when its processes are the fastest, many red spheres will be enlarged, pumping faster in the same way our body’s organs enlarge and pump faster when excited. With no interaction, each sphere will symbolise the mean measurements of its data set. On the tiled-floor of the concourse will be a network of piezoelectric panels, each a raccord to a data set. Each one is engraved with a graphic and text. When a person stands still on the panel, a corresponding sphere will represent digital data real time. During peak time, it will enlarge from an average size and beat much faster than average. When three people stand on the panel, the sphere symbolises the data of the whole Docklands precinct. 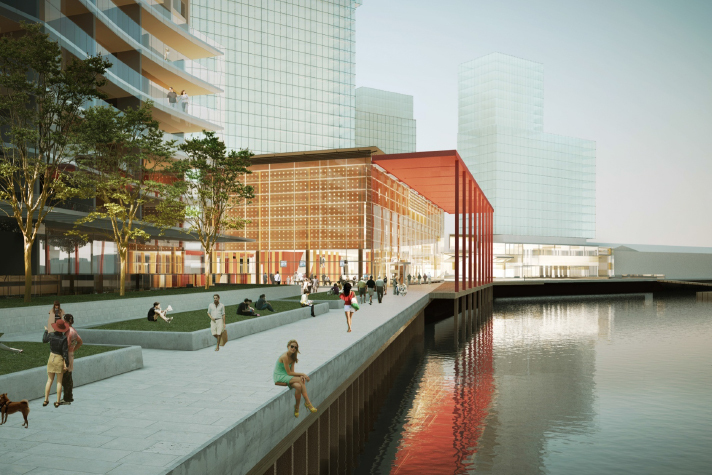 Kinetically, the group can compare the Docklands real-time data set in contrast to that of the library. On a really hot day the city statistic will grow and agitate the energy usage sphere, due to the many artificial air conditioning systems still being used today. This will physically show a strong contrast to the relaxed usage of the library’s passive solar design. When five people stand on the panel, it will show the data for the city real-time. Weight activating voltage to compressed air, filling the spheres and moving the mass and jungle above. The use of groups of people means that people will need to interact with each other, as well as the artwork itself. This becomes a game of experimenting and communicating on how to change the data. On each pillar will be a vertical LED ticker. When a panel is activated it will display on the closest pillar what the data set is (ie average city power use) as well as the data in numbers so that people can see and understand the actual figures and meanings. The piece will include data sets from the library itself, The City of Melbourne as well the rehabilitation of Victoria’s native species. Melbourne Zoo is leading successful work in increasing the number of 10 endangered species. This will be used to show a direct example of why the sustainability of the library actually matters. A reduction to the library’s environmental impact is interconnected to the rehabilitation of natural ecosystems and with it endangered species. Animals and birds clearly represent the natural environment and help to form an emotional bond with the people who interact with the space as the numbers in communities of endangered species return to health. The green spheres will represent live datasets of endangered animal and bird species. These will be updated quarterly – represented by a cluster of small spheres. When a person stands on the representative panel, the cluster will lower to provide interaction and to emphasise the data set with sound and movement. Because each cluster is physically connected to the main spheres each movement will affect the positioning of the main spheres set, thereby representing interconnection of data sets. We will need to partner with other stakeholders to integrate data sets and closely liaise with the Architects, library managers and building owners. Possible live data sets include: Electricity Generation; Electricity Usage; Water harvesting/storage; Water usage; Wind speeds; People in the building; People interacting via the website; and people pledging their own actions (would be a quick dramatic pulse). Possible data sets to be updated quarterly: Species populations; Melbourne’s population; Regional population, and all of the library building systems. A user-friendly smartphone App, furnished foyer and the communicative website will digitally support the artwork to provide more depth and information relating to the data sets. These are important to engage with the audience how they can reduce their impacts that are interconnected with the bigger ecosystem in the same way the library is. We will encourage people to make a pledge to reduce their own impacts and these pledges will then feed into the data sets. The smartphone App will overlay supporting information and action pathways over the visuals when viewing on a mobile devise and will include the features found on the website. It will allow users to compare their own smart energy meters in their home and workplace with that of the libary and city. Will feature touch screens that will display the website. Other screens will feature live feeds to nesting boxes and other related visual footage of the featured species. This will show a direct connection with the building to an individual or family of the species and bring an emotional element within the work. We envisage that local residents and regular visitors to the site will become interested in how the ten species are fairing. With the work exhibiting the species population fluctuations occurring over the life cycle of the work. As placemakers we see many many opportunities to build the concept and connection with the local neighbourhood of the Docklands, and visitors to the library. Music and events could interact with the stories of the pulsating spheres, information markets could connect to artificial systems, passive systems and buzz around saving endangered species. The home page will feature a live video feed of the installation so the website is always interconnected with the installation on site in realtime. Users will be directed to virtual replica of the installation and will allow the user to interact with the installation by clicking instead of standing on the panels. The user will also have an interface where they can view the behavior of the installation: for any time period of its history (we have all the data); adjust time lapses to be able to visualise time based data variables; load different “future presets” which will visualise the data according to different scenarios such as temperatures raising; and program custom variables real-time. The website will provide supporting information on the data, so people can understand it and explore it in more depth. A large component of the website and digital support materials will be to show how individual and community decisions and lifestyle are interconnected with the greater natural ecosystem – in this case symbolised by saving endangered animals and birds. This will include actions for the audience to take and allow people to pledge to make changes in their daily lives – both at home and the workplace. In many ways the library will serve a double function – informing people and collecting information. It will also act as a place for a conversation to gather. This user-audience information will then be fed back into the work in the form a heartbeat of one of the major spheres when someone signs up – displaying their profile pledge in the foyer and on the website. The profiles will then form a game, encouraging participants to work together, join existing organisations and earn points and rewards. Partner organisations wil be invited to run related events such as tree plantings and educational events and wetland tours etc. The story of the echology interconnected is about how the impact of one small building, a library, relates to an ecosystem of energy, water, numbers, communities, animals, birds and quite kinetically – living people.